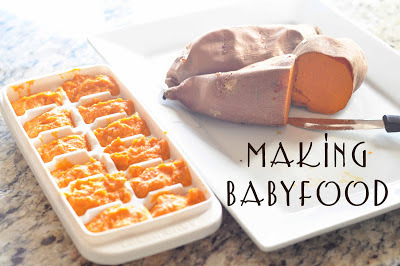 Making baby food is really quite easy to do! There are entire blogs and large books published on the topic, so this will not be an inclusive post on how to make all baby foods, but rather a post that breaks it down into the basic steps so you can see how easy it is and consider venturing into the world of making baby food. You can see my post “In Action: Making Babyfood” for more information and for reasons why I think you might like to do so. Here are the basic steps in making any food. For any vegetable, you will need to cook it. For younger babies, fruits will need to be cooked until six months old. After that age, you don’t necessarily need to cook a fruit. You can cook the food any way you like the food cooked. My opinion is that veggies taste better baked than boiled or microwaved, so I bake my food for my babies. For carrots, I cook them in the slowcooker. Whatever method you choose, you want the food to be very soft when done, so steaming might not be the best method for baby food for certain foods–I guess unless you steam it longer than I would steam for myself. I like my steamed veggies crisp. You can easily search recipes on the nice worldwide web for how to bake, microwave, boil, or slow cook vegetables. 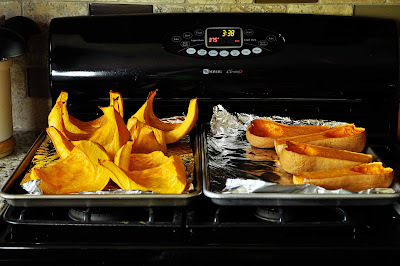 Cooking Tip: For cooking sweet potatoes, put a drip pan or a cookie sheet on the rack under the sweet potatoes. You cook them on the rack, but the juices will start to drip out at the end. 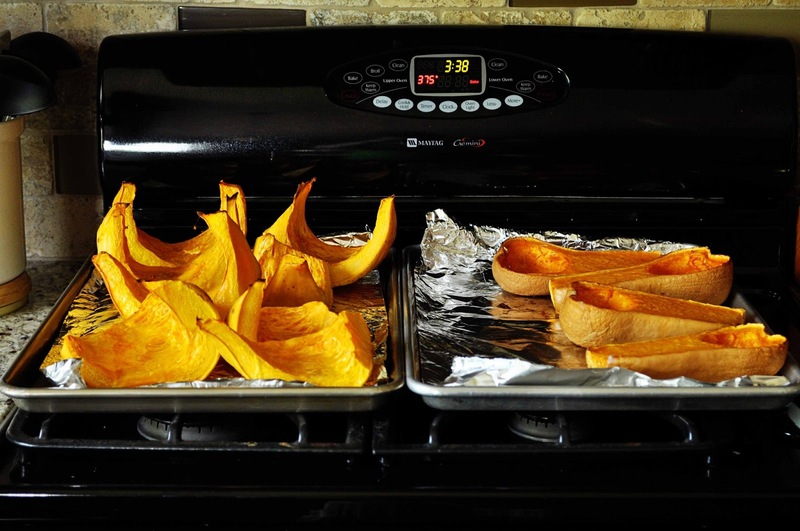 With a drip pan or cookie sheet, you can just clean that up instead of having to clean your whole oven. If you microwave or boil your vegetables, you will remove skins before you cook them. Sweet potatoes will literally just drop out of the skins when they are baked. I just take them out of the oven and let them cool enough that I can work with them without burning my fingers. I then cut them in half and let them cool more if I need to. I then hold it over my Cuisinart and just let the flesh drop out. For squash, I use a cookie scooper as pictured above. I scoop the squash out and drop it into my Cuisinart. If you are not cooking your fruits, you might want to blanch the fruit to aid in skin removal. Blanching sounds ominous before you try it. Google ways to blanch for videos or tutorials. Basically, you have a pot of boiling water on the stove and a sink full of ice cold water. You put your food in the boiling water for usually 1-2 minutes, then remove and put it in the ice cold water. The skin will then easily slip off (if the fruit was ripe–under ripe fruit doesn’t blanch so well). One way I puree the food is in my Cuisinart Food Processor. I put any food I have in large quantities in this. For example, I do squash, sweet potatoes, carrots, peas, prunes, and green beans in this. 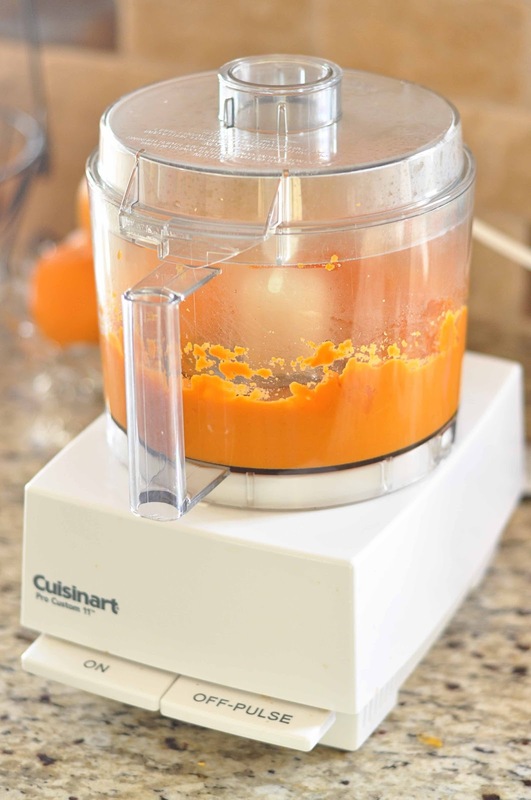 Another way to puree the food is with a Baby Food Mill. I use this for my bananas and avocados. You could use it for strawberries if you wanted to puree them. I will also use it to quickly puree some pears or peaches that I have preserved in mason jars. You could do smaller portions of the other foods in this, too. So if you made squash for the whole family, but wanted to puree some for baby, you could do just one portion in this. I also use this for squishing up my bananas for banana bread. It is an inexpensive baby tool and I find it useful beyond baby food. You can also use the old fashioned method of a fork to smash things up. A blender works great as does a potato smasher. The food will last for a couple of days in the refrigerator, so I save a couple of portions for baby in the fridge. The rest goes into ice cube trays. I scoop it using a spoon or my cookie scooper. I use traditional trays and the trays from Fresh Baby. I like the Fresh Baby ones best. 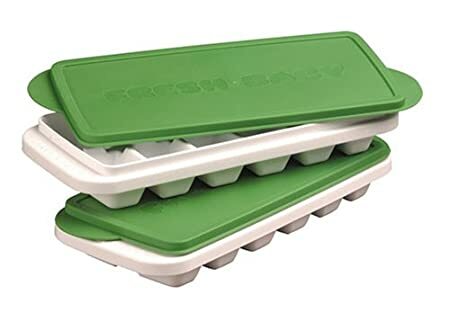 The lids help keep the food fresh and you can stack the trays easily. Once it has frozen (usually about 12 hours) you can move it into freezer bags. I write on the bag with a permanent marker with what it is and the month and year I made it. Then each morning, I get out any cubes I need for the day and put them into baby bowls with lids. See! Four basic steps to making your own pureed foods. I make enough at once that I only have to do it every few months. 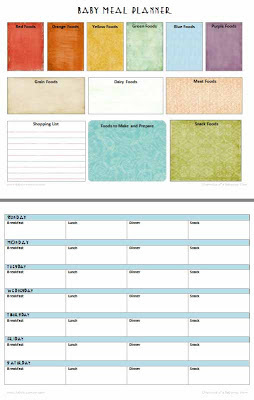 For keeping track of what you have introduced and what you plan to introduce, check out my free printable Baby Meal Planner. There are two resources I like best. Wholesome Babyfood.com: This is a great site, and is really the only resource you would need. Something nice about a website is that it is dynamic and they keep current recipes on the homepage. It offers lots of different recipes for each food. If you check out the avocado section, you will see several different ways to prepare avocado for your baby. This isn’t really necessary; baby is fine with the same old thing over and over, but you might find it fun. Super Baby Food : This is my favorite resource. I am more of a book person than a website person. I like to have books to look through. I keep this book in my kitchen with my recipe books. This book is worth it even just for the section on how to choose, store, prep, make, and keep all fruits and veggies. I use it for the whole family! If you prefer books, I would get this. Fresh Baby So Easy Baby Food Kit: I use this book for quick reference in finding what ages foods are recommended for. This book has fast microwaving tips. It also has great ideas for spices and herbs that go well with different foods. I make my own babyfood too. I love using the cuisinart stick blender, works just as good as a food processor and so much easier to clean. 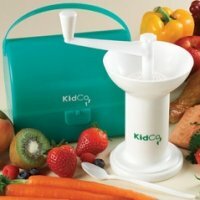 I also use it to make my toddlers smoothies, blend soup still in the pot, whisk homemade salad dressins, etc. I also use tovolo perfect cube ice trays. They hold exactly one oz of food which is great for keeping track if how much LO eats, plus they are perfect cubes which stacks great and saves space. I got them on amazon. They are silicone so it is soooo much easier to get the frozen cubes out of the tray! Thanks for sharing your favorites! I have a different brand of a "Stick blender" (immersion blender). I haven't ever tried making baby food with it–but I make huge batches at once so I think the food processor route is easier for me. I couldn't believe how easy it was to make babyfood when I was in that stage. I also loved the Wholesomebabyfood blog. I learned so much about different fruits and veggies I'd never worked with before too. I definitely think it was a money saver for most foods, and I really liked knowing how fresh the foods were too. Great post indeed! Being a working lady, I hardly get time to prepare baby food for my little boy so I end up buying it at the store. I often use vegetable crushing machine for making the purees of fruits and vegetables. Sometimes, I also purchase ready-made baby food packets as these baby food are as nutritious and healthy as the homemade food. This time, I tried Cow & Gate baby food packets which I purchased from Feeding for Life. These baby foods are full of nutritious and give a balanced diet to my baby.